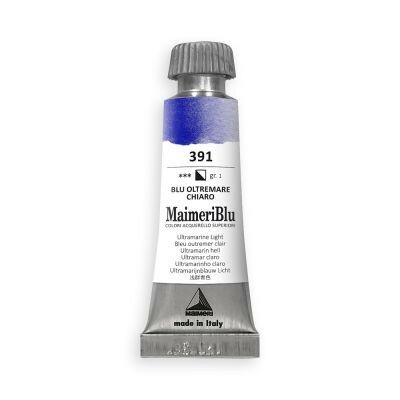 Marimeri Blu Artists Watercolour 12ml tubes are available in a spectrum of 90 single-pigment colours and are made from only the finest ingredients. Featuring only pure, artists quality pigments combined with Gum Arabic each of these 90 colours is specially formulated to bring out the best of the colour. Their perfection and purity allows for limitless layering, with transparencies that allow the texture and whiteness of the paper to shine. Each pigment is finely milled to produce the highest quality paint and all colours in the range have the highest degree of lightfasness. The range features a good balance of organic, inorganic and natural pigments - allowing you to create countless colour mixtures and clean, clear and authentic secondary shades. The range includes; 7 cadmium, 5 transparent cadmiums, 11 cobalt, 8 quinacridone, 5 phthalocyanine, 8 natural earth and ochre, 5 iron oxide pigments. Maimeri Blu are the purest, most balanced range with the widest spectrum of colour possibilities.